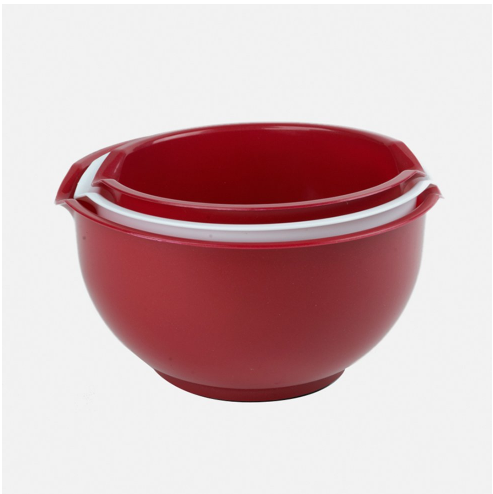 Red 3-Piece Mixing Bowl Set Only $6.99 + FREE Shipping (Reg. $16)! You are here: Home / Great Deals / Red 3-Piece Mixing Bowl Set Only $6.99 + FREE Shipping (Reg. $16)! Here’s an awesome kitchen deal for you! You can snag this Red 3-Piece Mixing Bowl Set for only $6.99 + FREE Shipping (Reg. $16) with coupon code FREESHIP48 through 9:59AM 12/8! Great for a new kitchen or an addition to any budding chef! With its handy space saving design, these can be stored easily and stacked effortlessly. Great for salads, fruits, vegetables, and more!